The following blog comes from Josh Collum (pictured above), Co-Founder and Partner at Sorted Noise, which makes and licenses music for TV, film, advertising, trailers, and other media, and is built around a community of Nashville-based artists. Recent work includes TV spots for Nutella and IKEA, a trailer for the Warner Bros film “If I Stay,” as well as songs in TV shows such as Mad Men, The Walking Dead, Breaking Bad, Pretty Little Liars, and Vampire Diaries. In addition to Sorted Noise, Josh is a successful singer / songwriter, particularly in the sync world. His band, Secrets in Stereo, has been licensed in film, TV, and advertising over 150 times and his songs have collected over 250,000,000 views on YouTube. There. In its rawest, purest form. This is what a song is worth on Spotify. Streaming fees, mechanicals, and performance royalties. Doesn’t seem right to you? Then you should definitely keep reading. Before Friday’s New York Times piece, you probably hadn’t heard of Perrin Lamb. He’s the singer songwriter behind those numbers in the headline (we’ll dig deeper into those in a minute). But I bet you have heard the horror stories of how streaming music is undercutting the careers of songwriters and artists. Of course, that’s not a streaming success story. And of course, indie artists you discover on Spotify will get paid. I was at a mixer recently in Nashville with over 200 songwriters and artists in the room, all of them making significant money through micro-licensing to indie films and small to mid-size brands. Money they had no way of making five years ago. These songwriters and artists represent a class and generation that has thrown away the old rules of the music business and begun writing the new ones. One of those new rules is to embrace streaming on all platforms, from Spotify to Youtube, and more. They’ve re-thought their businesses (yes, they are businesses) and the deals they choose to sign through the prism of a “Post-Napster” perspective. And they are making a living that simply was not possible five years ago. These are the true success stories. I think these success stories need to get more attention than they do. You see, in my world, Spotify is not the problem. I repeat… Spotify is not the problem. The key here is, are you the rights holder, or is a record label and/or publisher? Because that’s who’s receiving the 70%. If a writer or artist isn’t seeing the money, the answer to their question can probably be found within their label or publisher contract. The Boogey Man and the Cookie Monster aren’t stealing it. Every record or publishing deal is different, but most still use a “Pre-Napster” design and language that includes an advance, marketing budgets, and charged expenses that an artist or writer has to pay back. And once those are paid pack, the split on streaming royalties is heavily weighted towards the record label or publisher (Although, some companies are evolving and re-thinking the way they do business in this new, digital world, such as Kobalt, Downtown Music, Thirty Tigers, etc). On the other end of the spectrum, if you’re an independent artist that’s retained control of your music and distributes it to the platform “through certain digital distributors,” then you’ve got fewer hands in the cookie jar. You’re seeing more of that 70% and you’re feeling more of the positive impact the platform can have. They are two different business models. I figured, most people understand this. So, I’ve typically moved on, knowing that different artists and writers choose different paths. Some want or need to be signed. Some don’t. Neither path is right or wrong. I guess I’ve always assumed as we begin to better understand this digital ecosystem that we’re living in now, the pros and cons of our chosen paths would become clear and obvious. But recently, the House Judiciary Committee came to Nashville for a roundtable discussion on copyright reform. The roundtable was largely populated by people that shared Aloe and Thom’s perspective. Not surprisingly, the world that I live and work in everyday was not represented. The artists and songwriters that are flourishing in this new age were nowhere to be found. That’s when it became real for me. Laws could be made that would jeopardize this amazingly fruitful and growing ecosystem for the many, because of the stories and experiences of a few. That’s scary. It seems to me, that in order to truly address a problem we must fully understand it. And to fully understand it, we can’t just hear the horror stories. We should hear the success stories too. So, that’s why I wrote this piece: to show a different perspective on streaming. To be clear, just because Spotify exists doesn’t mean that you’re going to get millions of streams and make tons of money. The quality of your art still matters. Now more than ever. But, having said that, it isn’t unique or an anomaly to find true success through streaming either. As a songwriter and artist myself, I’ve personally seen royalty checks go from hundreds of dollars a quarter to tens of thousands from YouTube alone. My partners and I started Sorted Noise in large part to build on that. Now, we work with dozens of artists with similar stories. One just bought her first house. Another made thousands from Spotify while still in college (I don’t know about you, but I had to deliver pizzas for my beer money). Hopefully, one day, those stories and the tens of thousands like them will be heard, understood, and learned from. But today, we’ll start with one. It’s the story behind that New York Times piece and those numbers in the headline above. Perrin Lamb is your typical, Nashville indie singer-songwriter. He’s been in town for over a decade. He’s never been signed to a publishing or record deal. His music is delivered to Spotify by CD Baby, an indie music distributor that works with over 400,000 artists like him. He’s done well with syncs in TV and film, but income from songwriting and being a performing artist has never paid all of the bills. He’s always had other jobs along the way. He’s doing ok, but it hasn’t been easy. Then, in January of 2014, a song of his called “Everyone’s Got Something” was put on the Your Favorite Coffeehouse playlist on Spotify by their editorial team. The song had been out a year and hadn’t really done anything to that point. But, once it found its way onto the playlist… boom. Hundreds of thousands of plays turned into millions. To date, the song has about 13 million streams. And the streams have increased, not peaked, over time. He’ll make substantially more in the second year of being on the playlist than in the first. 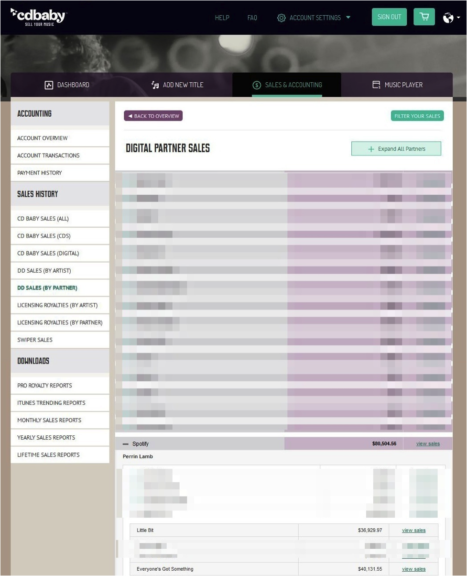 For transparency’s sake, our friends over at CD Baby sent over Perrin’s most recent sales report. You can view it here (right). When it comes to streaming fees, at last report, he’s been paid on 10,929,203 of those 13 million Spotify streams of “Everyone’s Got Something” to the tune of $44,100.60. After a distribution fee of 9%, $40,131.55 goes straight to the rights holder: Perrin. And keep in mind, the Spotify streams of one song don’t live in a vacuum. They are a driver for Perrin’s business and art as a whole. They drove up the streams on other songs he has on Spotify (you’ll see another song on this report called “Little Bit” that’s made about $37,000 in sales from about 11 million Spotify streams). Perrin’s download sales have gone up. Fan-made YouTube videos have been posted and he’s collecting on those royalties through our friends at Rumblefish. You see, the “Post-Napster” digital ecosystem is a connected one. And if your business is structured in a way to capitalize on it, that connectivity can be incredibly powerful. And profitable. So, my hope in sharing this is to show that there is in fact… hope. And even beyond hope, there is reason to be excited. We are still in the infant stages of this digital migration, and there are already thousands and thousands of true success stories like Perrin’s. There are already artists and songwriters that are figuring out how to build strong, agile businesses for this new age. As we navigate the growing pains of this migration, and potentially decide on law, we have to be just as willing to hear their stories as we are to hear from songwriters and artists that are signed. It’s too important not to.